Scientists are trying to find out if, in addition to a molecule's shape, its vibrational energy also plays a role in how we distinguish smells. 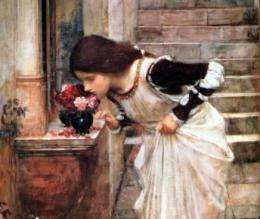 Image is part of an 1895 painting by John William Waterhouse. (PhysOrg.com) -- Since 1996, when biophysicist Luca Turin first suggested that quantum mechanics may help explain how we smell various odors, the idea has met with controversy. In the past 15 years, some studies have found evidence supporting the theory, while other studies have found problems with it. Now Turin - who is currently at MIT and the Fleming Biomedical Sciences Research Centre in Vari, Greece - along with his colleagues, has published a study that provides further evidence for the vibration theory of smell, and may make the theory a bit less controversial. In the traditional lock and key model of smell, odorant molecules of different shapes and sizes fit into different receptors, similar to the current understanding of how drugs affect the body. When a molecule enters a receptor, the receptor sends a signal to the brain, and we smell that molecule. However, there is one problem with this model, which is that some molecules with nearly identical shapes smell very different. This evidence suggests that some other criteria in addition to size and shape must cause receptors to react differently and to send different signals to the brain. According to Turins theory, the additional criteria are the vibrational frequencies of odorant molecules. A molecules vibrational frequency can cause electrons in the nasal receptors to tunnel between two energy states if the vibrational frequency matches the energy difference of the two states. Tunneling is a quantum mechanical phenomenon, since the electrons do not have enough energy to move between the two states by classical means. When receptors detect these vibrational frequencies, they send signals to the brain based on the molecules vibrations in addition to their shapes. The theory is controversial: the prestigious science journal Nature rejected Turins original paper, and some studies have found evidence that conflicts with the theory. But other studies have found the theory to be mathematically and physically sound. For instance, in 2007, Jennifer Brookes, et al., found that Turins vibration theory of smell is consistent with the laws of physics, and also that there appears to be a connection between a molecules vibration spectrum and its odor. In Turin and his coauthors latest study, the scientists found that flies can distinguish between an odorant molecule containing hydrogen and the same molecule when the hydrogen is replaced with the isotope deuterium. While hydrogen and deuterium have the same shape, deuterium has a lower vibrational frequency. The scientists also trained the flies to avoid either of the two molecules. They found that flies trained to avoid an odorant molecule containing deuterium also avoided an unrelated molecule with a similar vibrational mode. Because the flies reacted similarly to molecules with similar vibrational energies but different shapes, the results support the theory that molecular vibration plays an important role in how flies distinguish smells. Overall, the researchers still have a lot of details to work out in the theory. However, the idea is slowly becoming more acceptable, as demonstrated by presentations given at a recent meeting of the American Physical Society in Dallas, Texas. If scientists can better understand the details about how we smell, they could potentially design an electronic nose that is superior to todays chemical sensors. Turin's book 'The Emperor of Scent' , as well as being a good read is a study of the way a scientific establishment will put barriers in the way of a new explanatory idea rather than explore it in a detached way. Social standing seems to trump the search for truth , at least in the short term.